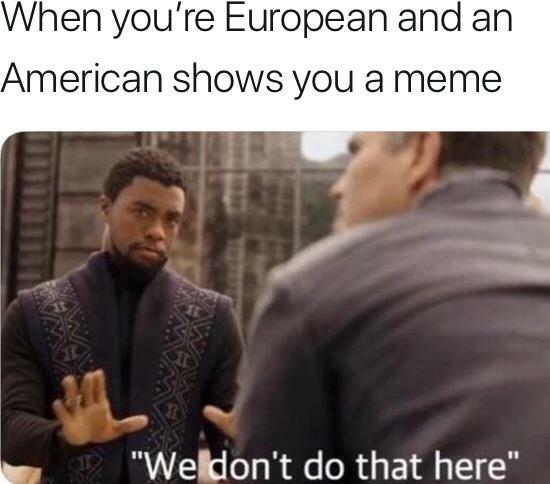 Generally speaking the world of European politics and memes have very little overlap. However, a vote on the 10th of September in the European Parliament has brought together two parties that are traditionally mutually exclusive. Article 13 of the ‘European Union Directive on Copyright in the Digital Single Market’ has the unique privilege of forging an alliance between legal scholars, lawyers and, the backbone of the internet: ‘memers’. Article 13 of the EU Copyright Directive was brought forward by Axel Voss, a German centre right politician, and is intended to be an overhaul of the current EU copyright laws fit for the the era of new media. While this is a good idea in theory, in practice the results could be catastrophic. Cecilia Bonefeld-Dahl, the director-general of Digital Europe wrote that ‘the main ambition of the Commission and Parliament was to create a non-fragmented Digital Single Market where innovation in the creative sector can flourish’. However, Bonefeld-Dahl goes on to suggest that Article 13 will be ‘a grand failure’ (Bonefeld-Dahl, 2018). Indeed, Article 13 has come under scrutiny from numerous high profile individuals. An open letter addressing the problematic nature of the legislation was addressed to Antonio Tajani, the President of the European Parliament. This letter contained multiple signees including the inventor of the World Wide Web; Sir Tim Berners-Lee, media scholar Ethan Zuckerman and the co-founder of Wikipedia Jimmy Wales, to name a few. This letter argues that Article 13 ‘would mandate Internet platforms to embed an automated infrastructure for monitoring and censorship deep into their networks’ (Cerf, et al. 2018). In order to correctly recognise copyrighted material, web platforms such as Facebook and Google will be forced to introduce software that scans uploaded information for copyrighted material. However, According to theorists, ‘the technology simply doesn’t exist to scan the Internet’s content in this way,’ (Vincent & Brandom, 2018). Indeed, even if this technology did exist, ‘Algorithms cannot interpret context, therefore may delete memes,’ (Vincent & Brandom, 2018). This is particularly problematic as memes satirise popular culture references that may be copyrighted. However, the use of copyrighted material in memes are not intend to make profit, but to share opinions or jokes that rely on common cultural tropes that usually originate from Hollywood. Under Article 13, online platforms and publishers of new media will be obliged to remove copyrighted content or face fines. Monique Goyens, the director-general of the Bureau Européen des Unions de Consommateurs, suggested that ‘The internet as we know it will change when platforms will need to systematically filter content that users want to upload. The internet will change from a place where consumers can enjoy sharing creations and ideas to an environment that is restricted and controlled,’(Rankin, 2018). In my opinion, this vote is a step towards the Orwellian digital future that Galloway and Thacker’s predicted when they wrote: ‘the Internet is a high-bandwidth security camera’. (Galloway and Thacker, The Exploit 132). Indeed, when every upload is monitored, the public will have their privacy revoked at the expense of the copyright industry. Eric Hall writes that ‘the Internet is specifically meant to be a collection of autonomous hosts that can communicate with each other freely’, (Hall, 2000 6). Therefore I believe that Voss’ claim that ‘We will not end the internet’, (Rankin, 2018) is a lie. This is because Article 13 will directly attack the ability for autonomous hosts to communicate freely. Perhaps accusing politicians of lying may be a stretch too far. I mean politicians are always benevolent right? Unlike the perjuring politician pictured above, I genuinely do believe that Voss is not intentionally misleading the public. His desire to limit the amount of money that platforms such as Facebook and Google make out of perpetuating copyrighted material may seem pure. However his ‘solution’ is a gross oversimplification that will have detrimental effects on small tech companies that cannot afford to design and implement extensive filtering software. Julia Reda, one of the most vehement adversaries of Article 13, believes that Voss does not intend to subjugate a large portion of European web browsers, but that his proposition is instead due to lack of digital education. ‘These laws are written to a large extent by politicians who don’t use the internet very actively,’ Reda suggests, ‘If you think the internet is made up of just YouTube and Facebook, you will come up with this sort of sweeping legislation’, (Vincent & Brandom, 2018). John Cheney-Lippold’s words seem particularly poignant in today’s society, where corporations and governments are constantly vying for control of Human Capital. Cheney-Lippold writes that ‘Rules are both intentionally and unintentionally written into the hardware and software of Internet technologies that then create the infrastructure that determines how we as users can act in cyberspace,’ (Cheney-Lippold, 2011 166).With the previous quote in mind one can see that Article 13 is a rule that will be intentionally written into internet technologies in order to monitor how European citizens act in cyberspace. Perhaps the reason that I personally take so much issue with Article 13 is the fact that, to borrow the terminology coined by Davis and Chouinard, it ends the ‘request’ that we behave in good faith on the internet, and instead ‘demands’ that platforms monitor what the individual uploads (Davis & Chouinard, 2016). We seem to have strayed from Foucault’s vision of an ideal future. The very politicians that ‘represent us’ are using existing power structures, such as the European Court, to subject us to intense scrutiny. One cannot help but compare the creation of one modern Prometheus to another; Berners-Lee’s states that his vision for the internet is being distorted by extensive legislation. In a discussion with Wired editor David Rowan, Berners-Lee said that he wants ‘a Web that’s open, works internationally, works as well as possible, and is not nation-based’ (Berners-Lee, 2014). However the Internet seem to be drifting away from its creator’s idealistic vision, and instead is becoming one of the many ‘different modes by which, in our culture, human beings are made subjects’. (Foucault, 1982: 208). Berners-Lee, Tim. “Tim Berners-Lee: We Need to Re-Decentralize the Web.” Ars Technica, Ars Technica, 6 Feb. 2014, arstechnica.com/tech-policy/2014/02/tim-berners-lee-we-need-to-re-decentralize-the-web/. Bonefeld-Dahl, Cecilia. “European Parliament Takes Step Backwards on Copyright in the Digital Single Market .” DigitalEurope.org, Brussles, 20 June 2018, www.digitaleurope.org/DesktopModules/Bring2mind/DMX/Download.aspx?Command=Core_Download&EntryId=2689&language=en-US&PortalId=0&TabId=353. Cerf, Vinton et al., “Rticle 13 of the EU Copyright Directive Threatens the Internet.” Received by Antonio Tajani MEP, Eff.org, 12 June 2018, www.eff.org/files/2018/06/13/article13letter.pdf. Cheney-Lippold, John. “A New Algorithmic Identity.” Theory, Culture & Society, vol. 28, no. 6, 2 Dec. 2011, pp. 164–181., doi:10.1177/0263276411424420. Davis, Jenny L., and James B. Chouinard. “Theorizing Affordances: From Request to Refuse.” Bulletin of Science, Technology & Society, vol. 36, no. 4, 2016, pp. 241–248., doi:10.1177/0270467617714944. Foucault, Michel. Space, Knowledge and Power: Foucault and Geography. Edited by Jeremy W. Crampton and Stuart Elden. Translated by Gerald Moore, Ashgate, 2007. Rankin, Jennifer. “EU Votes for Copyright Law That Would Make Internet a ‘Tool for Control’.” The Guardian, Guardian News and Media, 20 June 2018, www.theguardian.com/technology/2018/jun/20/eu-votes-for-copyright-law-that-would-make-internet-a-tool-for-control. Vincent, James, and Russell Brandom. “Everything You Need to Know about Europe’s New Copyright Directive.” The Verge, The Verge, 13 Sept. 2018, www.theverge.com/2018/9/13/17854158/eu-copyright-directive-article-13-11-internet-censorship-google. Blueberrybrown. “Invest in Article 13 Memes?” Reddit, June 2018, www.reddit.com/r/MemeEconomy/comments/8qekax/invest_in_article_13_memes/. Maumaudonkeyhumps. 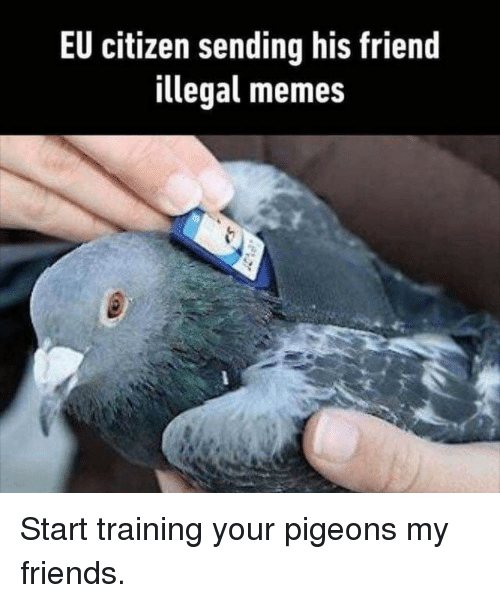 “Start Training Your Pigeons My Friends.” Imgur, 14 Sept. 2018, imgur.com/C2cPcYY. « Don’t ask my name, just scan!